Whenever global travellers get together the talk always turns to topics like: "What's the worst meal you ever ate," or "the worst road you've ever travelled?" I remember once eating a bowl of rancid yak butter tea, finger-stirred by a Tibetan nomad who claimed never to have washed in his life. But when it comes to reminiscing about the worst road I've ever encountered, the climb to Bokor Hill rates top marks. The road to Bokor is the only reason most travellers make the effort to ride a third-class bus down to Kampot, a small fishing town on the coastline of southern Cambodia. Kampot is generously described in several guidebooks as a "charming post-colonial fishing town that is quickly drawing off-the-beaten-track travellers to explore its many local attractions." This is an exaggeration. There is, in fact, only one local attraction worth visiting, the abandoned French resort of Bokor. Making it to the top of 3,000-foot Bokor Hill is a challenge even for those who fancy themselves seasoned, off-the-beaten-track travellers. The economy of Kampot could benefit handsomely from a shop selling "I survived the Road to Bokor" T-shirts. 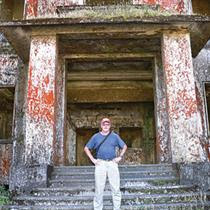 Bokor was built by the French when les Gauls were busy exploiting Indochina. In true Gallic fashion, they constructed a hotel and casino to rid themselves of their ill-gotten gains, serving up fine wines and gourmet food in the foggy mists of a remote hilltop jungle a full day's drive south of the Cambodian capital of Phnom Penh. When the resort was first constructed, Bokor could be reached by motorcar over a paved 32-kilometre two-lane road from nearby Kampot. The French abandoned Bokor after the Second World War. Affluent Cambodians then frequented the casino until the early 1970s, when it was again abandoned when the Khmer Rouge took over the area, using the hill station as a base of war operations. The Vietnamese then invaded Cambodia, and the Khmer Rouge made its last stand atop Bokor Hill. After the Vietnamese victory, Bokor was abandoned for good. Today, nothing much remains except war-blasted ghostly ruins. One travel writer famously described the ruins of Bokor in the fog as "the eeriest place in the world," and that single phrase became responsible for the tourist trade that Bokor now enjoys. Some 40 years of sincere neglect have also turned the road up Bokor Hill into a goat path worthy of a TV truck commercial. Our vehicle was a battered Toyota Camry with spidery cracks running all over the windshield, huge dents in the sides and both front and rear bumpers bashed in. However, a quick inspection revealed a truck engine under the hood, a truck suspension and new tires. We plunged into the jungle, the road immediately diminishing to a single track. Within five minutes we came upon our first wreck, a pickup truck with its dozen passengers standing woefully in the overwhelming heat while watching the driver bash bravely at the front right wheel. Within minutes we came across two more wrecks. The Inuit have 17 words for snow; there ought to be at least two words to describe Bokor potholes, both starting with the letter F. Some of them, if you bothered to measure, were over 20 feet wide and several feet deep. We endured three hours of teeth-grinding, head-bashing and face-smashing hell, finally arriving at the top where we were joined by our partner truck whose passengers looked like they had been in a fire fight with the Khmer Rouge. We poked around the ruins, progressing from an old church to the ranger station, and a small guesthouse that had been built to accommodate rare overnight visitors. This was where the travel writer who coined the phrase "the eeriest place in the world" had stayed one chilly night in the fog. The abandoned hotel and casino loomed in the distance on the very edge of a vast precipice. I could see how eerie the place might be in the dark and drifting fog and why actor-turned director Matt Dillon filmed the movie City of Ghosts here. We approached the casino, a ghostly sight with its broken windows and gaping doors. Our guide gave us the history: "Some gamblers, they get drunk at casino and lose all money, then they jump off cliff. Ha ha. Many ghosts in casino." The thought of rich gamblers doing swan dives off a 2,500 foot cliff only added to the overall spookiness. Obviously a grand structure at one time, the hotel now looked like a set for a Stephen King horror movie. We paused on the steps of its once grand entrance way, now a crumbling mess of broken brick, and our guide gave us strict warnings. "Very dangerous. Many broken things. Stairs bad," he said. "Don't go basement. Khmer Rouge take many prisoners, they torture. Many ghosts in casino. Visitor, they try to stay here overnight on dare. Nobody stay longer than three hours." The basement did have a clammy feel to it, not relieved by the bloodstains on the walls. None of the upper floors were painted with the word "redrum" but all gave off a distinct whiff of the grave. The view from the rooftop garden, now a complete shambles, was spectacular. One could easily imagine tuxedo-clad guests with glasses of champagne in hand taking headers off the cliffs as dawn approached. The Cambodian government recently announced that a private developer will soon build a new resort atop the mountain, and the famous road to Bokor has subsequently been closed.